After close to two years, Ajith’s Vivegam has hit the screens today amid much expectations from the fans. 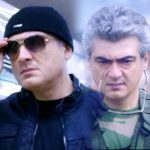 Ajith is a senior officer in the International Agency, Counter Terrorist Force. He works with a team in which Vivek Oberoi is also a part. Ajith is assigned the job of finding a person who has the code to activate and deactivate nuclear bombs planted in different areas across the globe. Does he succeed in his mission and what are the hurdles that he faced in the course forms the rest of the story. The hardwork that Ajith has put in for this film is summed up during the end card and it is truly inspiring to be dedicated to work. He has got a great physique in the flick to suit his role. He is stylish as usual and the stunts are action packed. He has mouthed numerous punch dialogues in the movie and they strike the right chord with the audience. 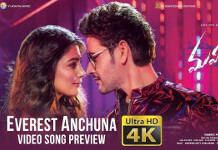 Director Siva has delivered what he promised, the movie is on par with international thriller movies with each frame engrossed with technology and visual excellence. This is easily one of the best performances of Kajal Agarwal who has played the role of a loving and bold wife with a certain change in her body language and dialogue deliveries from her previous movies. Vivek Oberoi who has made his Kollywood debut is a class act with his stylish acting and dialogue delivery. Akshara Haasan another debutant in the movie has got only a few sequences, however she has made a mark with her acting. Anirudh Ravichander has given life to the scenes with his music. Cinematography by Vettri has captured every scene with Hollywood standard and has matched to the speed of the director’s thought.